Atlas Copco's GVS A vacuum pumps have been designed to minimize total operating expenses. The pumps have been created for both research and industrial production applications, such as packaging; wood processing; rubber; plastics; paper and printing; and material handling environments. GVS A pumps provide flow rates from 16 to 700 m3/h, have motor ratings between 0.75 and 15 kW and offer working pressures between 0.1 and 0.5 mbar. The units have a smaller footprint, making them easier to build into machines or install within a workplace. They also offer lower vibrations and are about 3 to 5 dB(A) quieter. Crucially, the pumps operate at optimized shaft speeds, which can reduce wear and protect the oil consistency in the pump. The pumps operate with internal injection channels, reducing the number of gaskets and the amount of external piping required. In total, the number of components has been reduced by 20%. 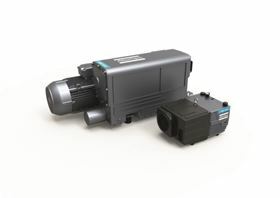 Atlas Copco claims that the GVS A pumps can handle higher inlet pressures than other rotary vane pumps.